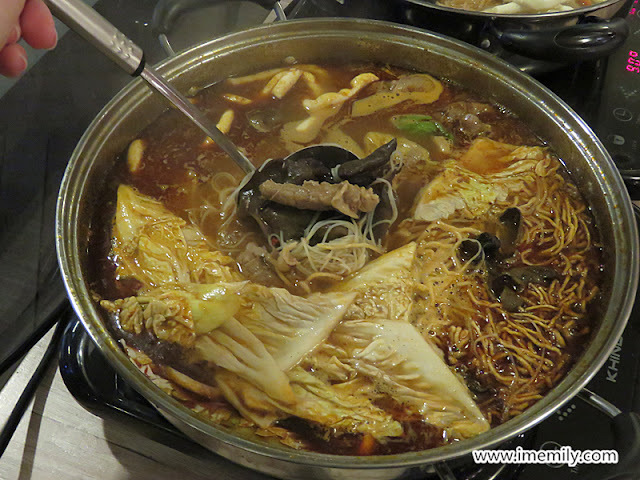 Nothing beats the steamboat dinner during a cold night! Do you agree with me? Kuala Lumpur is now having a great rainfall and thanks God we don't encounter the scary typhoon like happening in Hong Kong recently. Back to the topic, diners at Chatz Brasserie can now treat themselves to a wholesome goodness of meat, seafood, noodles, mushrooms, bean curd, egg and vegetables cooked in a choice of herbal chicken, tom yam, ma la (spicy numb) and goji soup. 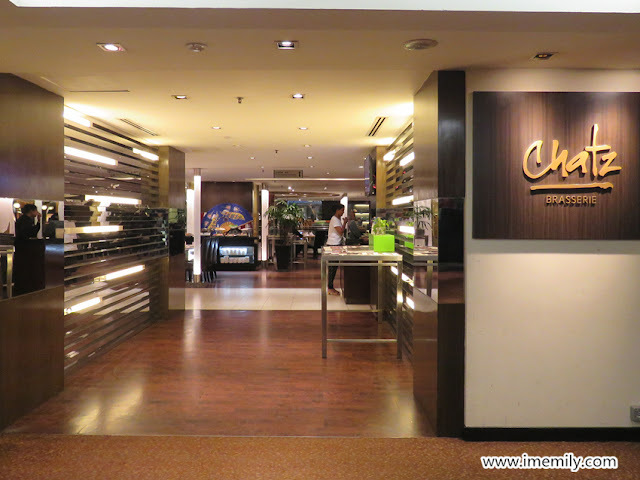 So now in house guests have another alternative at the PARKROYAL Kuala Lumpur. 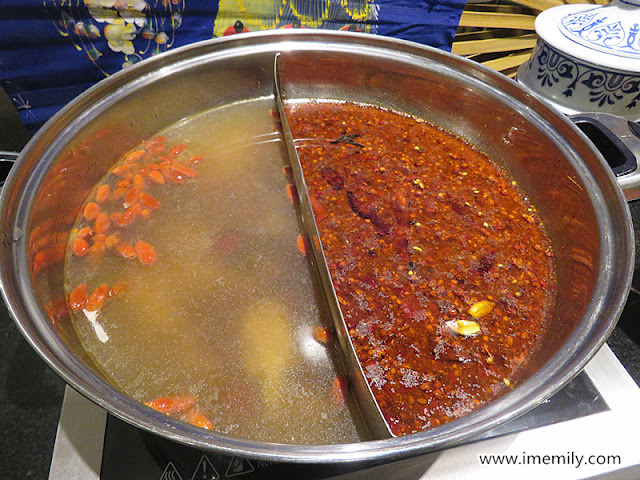 The clear soup is herbal chicken soup while the red one is ma la soup. We have these two soups served on our table prior to our arrival. 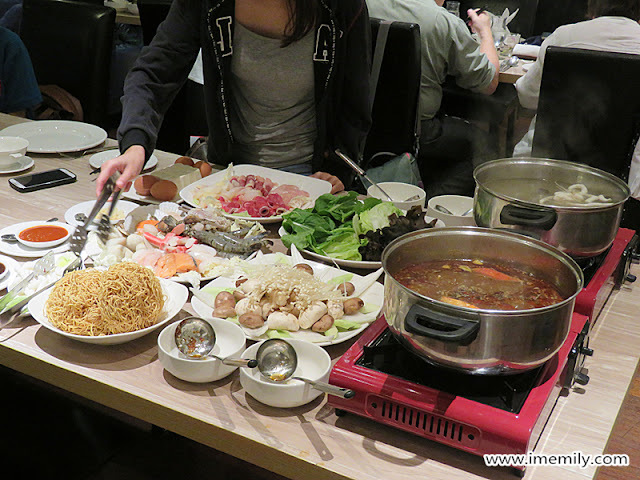 A table of generously prepared ingredients to ensure a delightful steamboat experience for every diner. 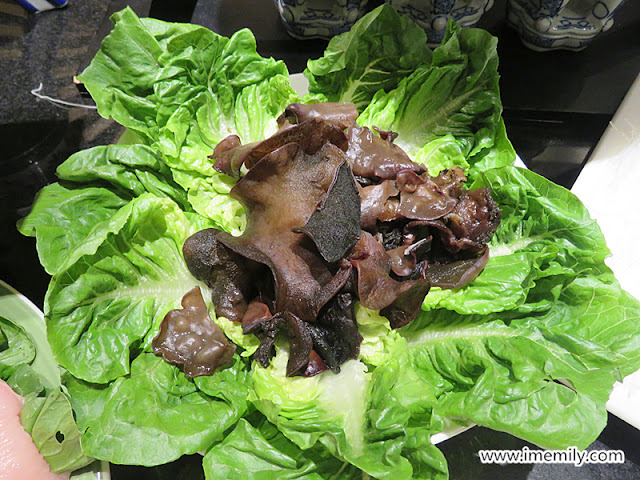 Healthy garden picks range from Tianjin cabbage, China Leek, Cameron Lettuce, Hong Kong Choy Sum to Black Fungus. 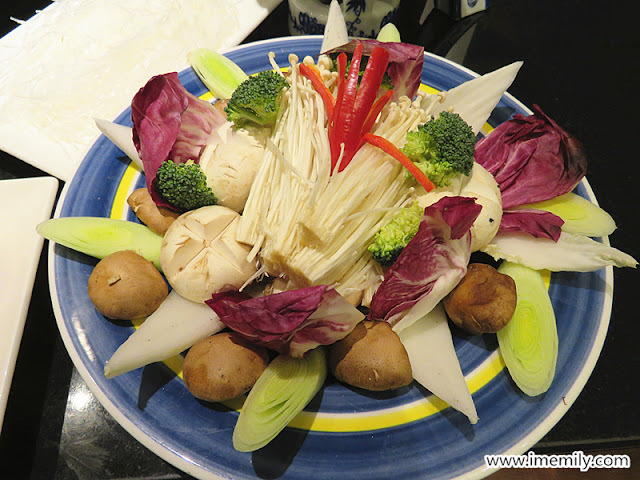 Choices of Mountain mushroom include Button, Enoki, Abalone and Shitake. 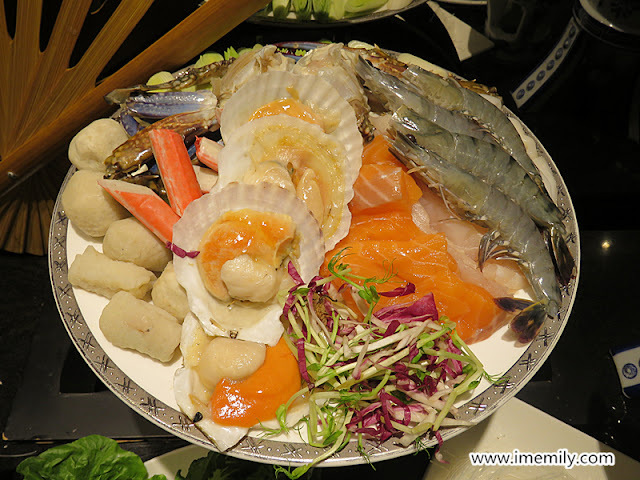 A variety of seafood offerings to complete the meal. 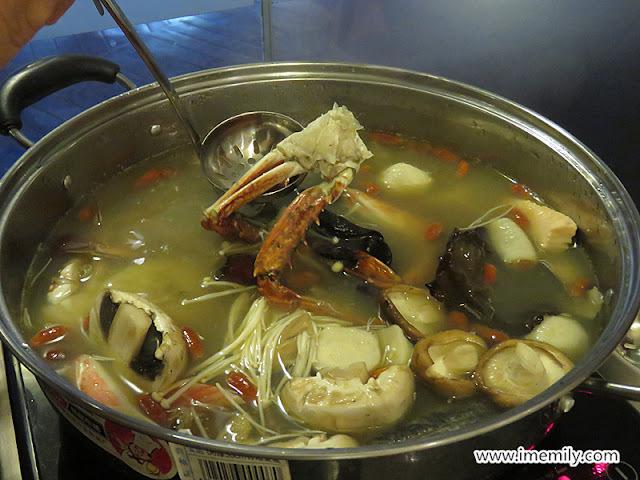 They include Fresh Catch Fish Fillet of the Day, Sulu Sea Prawns, Haf Shell Sea Scallops, Flower Crabs, Norwegian Salmon Fillet, Jellyfish, Fish Rolls, Fish Balls and Crab sticks. 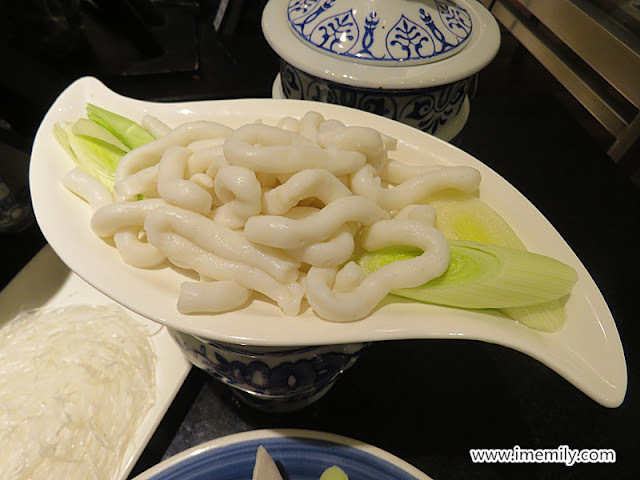 Australian Beef Tenderloin, Australian Beef Tripe, New Zealand Mutton and Free Range Chicken Strips are served too. 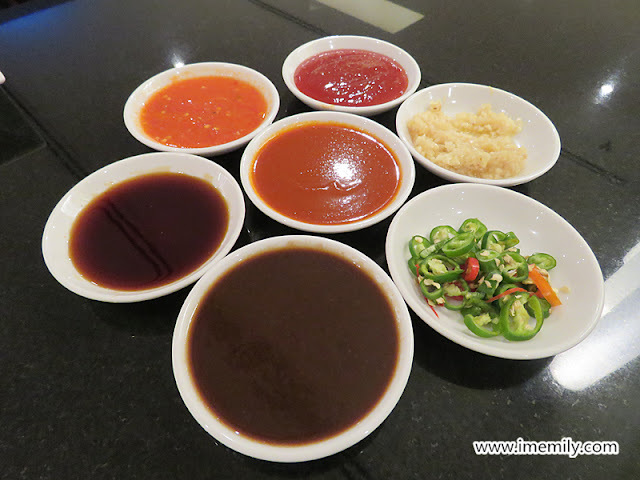 These ingredients can be enjoyed with condiments and dipping like Chopped Garlic, Chopped Red Chilli, Soy Sauce, Home-made Chilli Padi Dip, Sukiyaki Sauce and Black & White Sesame Dipping Sauce. 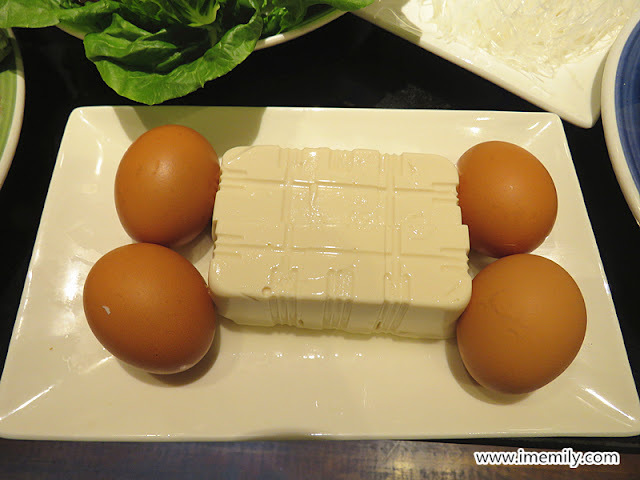 Included in the plate are fish noodles, glass noodles, mee hon, emperor noodles, bean curd and eggs. 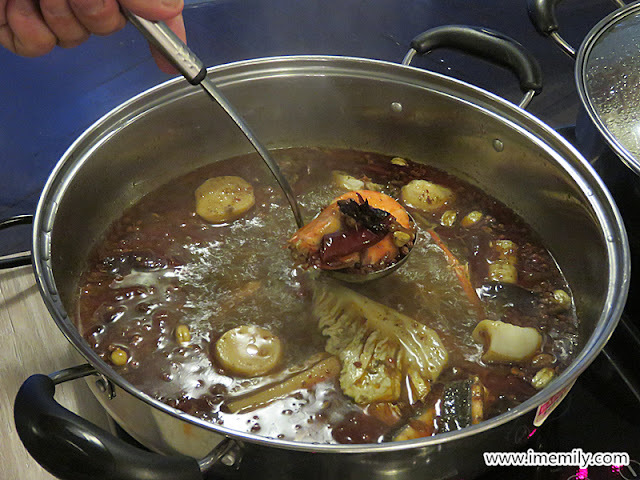 After tasted 4 types of soup, my favourite still goes to herbal chicken soup. The steamboat dinner is priced at RM83 nett per person with a minimum of 2 diners and available on Sunday to thursday, from 6.30 - 10.30pm. I love steamboat. But no spicy as my kids don't take it spicy. Weather has been cooling lately. That so cool you get to cook your food at your table. Nature Bounty Supplement Now in Watsons Malaysia! 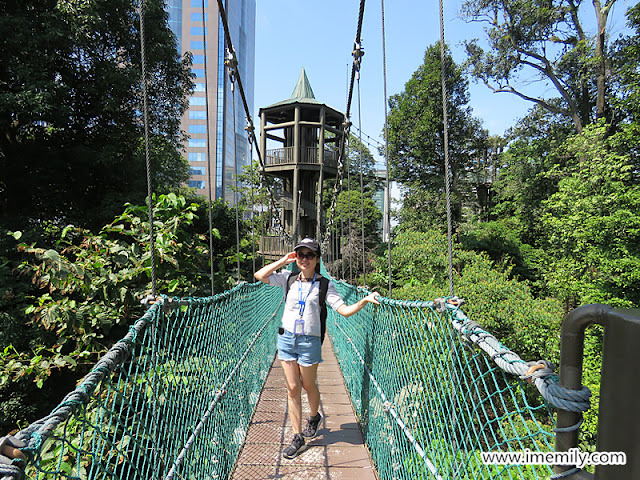 If you wanna take a leisure walk with greenery surround you, Bukit Nanas Eco Park is a great place for it. The entrances of Bukit Nanas Eco Park are either through KL tower there or the down hill side. But no parking slot for the down hill. If you plan to go this park, it is advised to park at KL tower or otherwise use public transport. The best I recommend would be the public transport as the parking rate at KL tower is not cheap. I studied in St John Institution for STPM last time. I knew about this place and always passed by but never got any motivation to pay a visit. 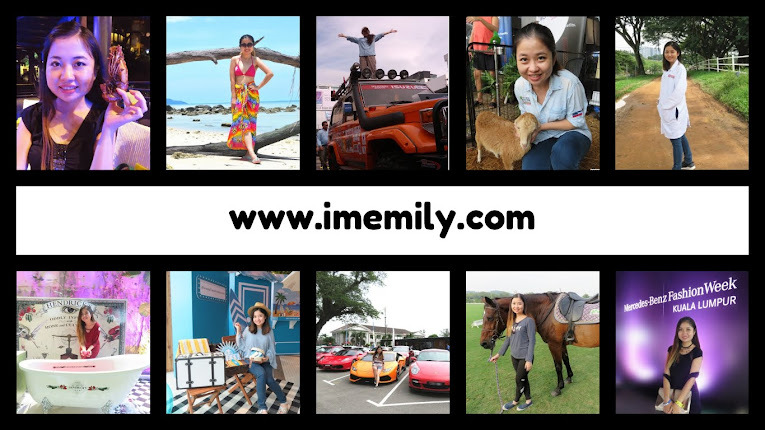 Until I saw my friends posted some very nice pictures in instagram that started to get my attention on it. Bukit Nanas Eco Park also known as KL Forest Eco Park, managed by Forestry Department Peninsular Malaysia, Ministry of Natural Resources and Environment. If you coming from downhill, this is the pathway leading to the suspension bridge. Clozette coming back to Malaysia for the first meet up in March last month at Happ Cafe, Tropicana. It was just about 5 months away from the last year gathering. For those who yet to check what's Clozette about, please head over to their website: https://www.clozette.co to have a look. 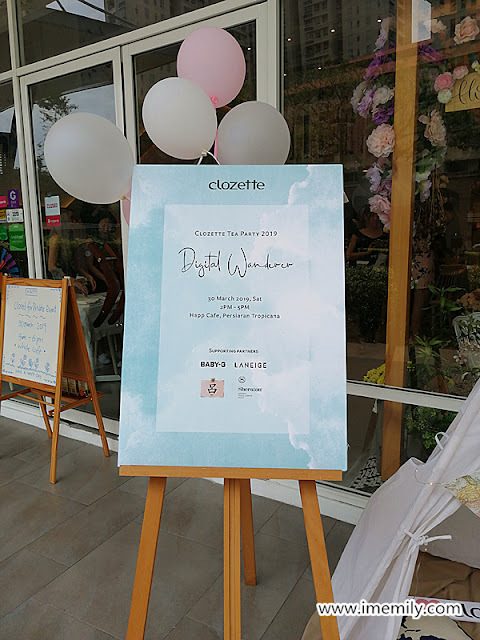 The theme of Clozette Tea Party 2019 was Digital Wanderer. The party also gained support from brands like Laneige, Baby-G, Sheraton Hotel and Ryo Shampoo. This time I saw many new faces who I never met before. To my surprise, they gave away Laneige Layering Cover Cushion to every guest attending that day. On top of that, they also helped to customize our Laneige cushion set with our name. This time I had to do it myself. They demo on a finger for you and the rest you had to do it. Overall, I spent about 15 minutes trying to fit the nail stickers nicely on every finger and trim off the remaining that was out of shape. Apart from Silver Leaf Monkeys, fireflies and seafood, Kuala Selangor also famous with Ramadas Pottery. Ramadas is the name of the owner. He born in 1951, been active in this industry since 1976. His expertise is imparted from his father in early year. In year 2012, he took over the business from his father and continue until today. Ramadas has been awarded as Adiguru Kraf Tembikar (Pottery Master Craftsman) in 2012 due to his achievement and expertise in pottery field. His products include pots, incense burner, clay pots, decoration for house and worship statue. It is a fun experience. The machine kept on spinning and we had to continue shaped it using our fingers. 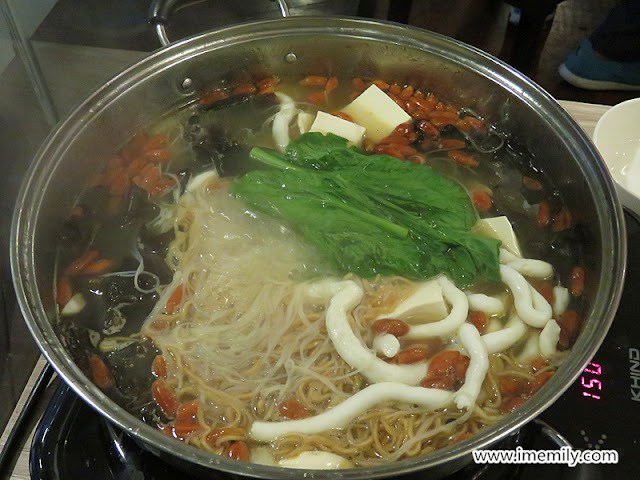 If we use too much force, the clay pot will be corrupted and we have to do it again. 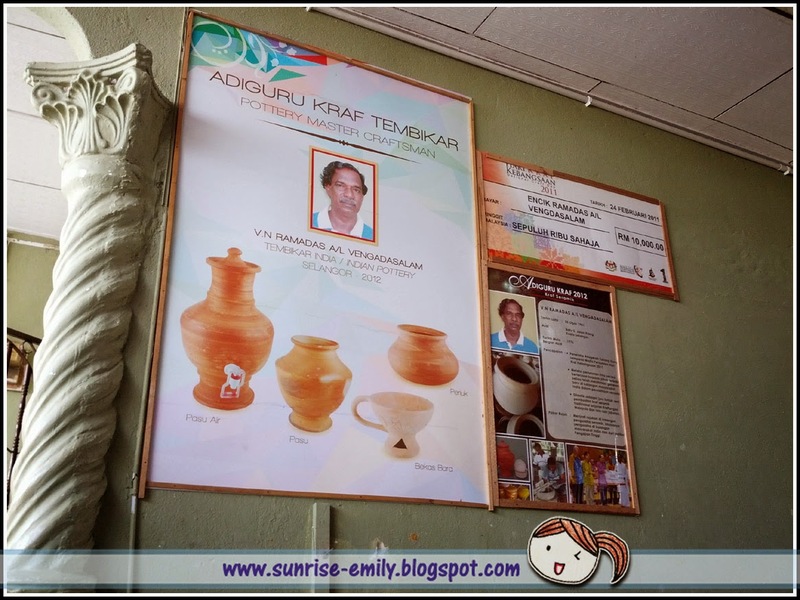 So next time if you paid a visit to Kuala Selangor, don't forget to visit Ramadas Pottery. Address: Batu Dua, Jalan Kelang, 45000 Kuala Selangor, Selangor. This was not my first time visiting government clinic but truly my first time been to Klinik Kesihatan Balakong. I never know about this place until my mum told me about it. All the while, I brought my family to Klinik Kesihatan Batu 9 for medical diagnosis. Comparing both clinics, Klinik Kesihatan Balakong is much smaller in size and has limited functionality compared with Klinik Kesihatan Batu 9. 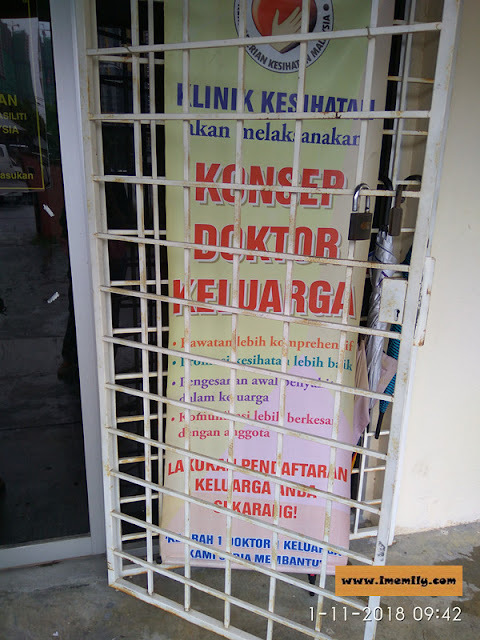 Klinik Kesihatan Batu 9 has been much developed and expanded in size throughout the years. Things are more organized there. I will share my experience to those who interested seeking medical treatment from these 2 clinics especially newbies who never visited any. Pulau Besar which means big island in English is once known as Pulau Babi Besar or Big Boar Island. But you can't find any boar on this island now, in old days I am not too sure. If you google, there is another island at Melaka with the same name. Hopefully, you don't mix up both. I'm talking about Pulau Besar, Johor which situated at Mersing district. To get to this small town where the jetty located, you need to drive at least an hour journey from Kluang. The road is not as smooth as we see in KL, it is narrow, bumpy and crooked. There are hills of palm oil plantation along the road thus advised to clear your urinary bladder before you drive down as no toilet available. Once we reach Mersing town, there is a toilet available at Mersing Harbour Centre that charged a few cents per entry. Batam Trail Run is the first international run event that I ever join. 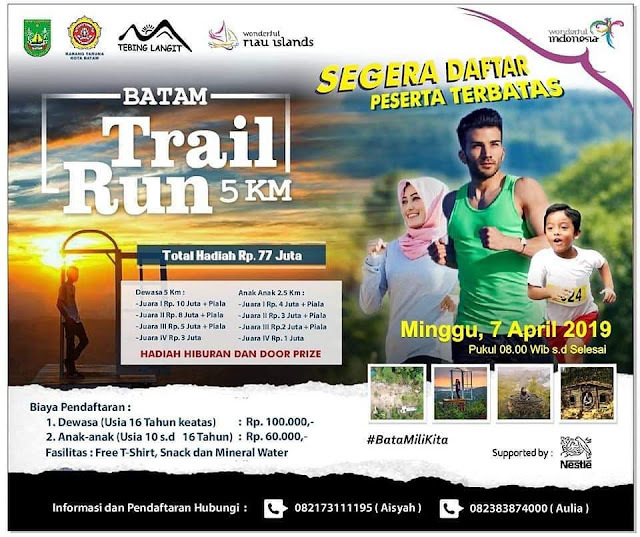 Batam Trail Run 5 km was organised with the co-operation from Team Tebing Langit and Karang Taruna Kota Batam, to boost sports tourism in Batam, Indonesia. The run also offer participants' another type of travel experience in the nature of Batam while engaging in the sport activity.That was an interesting route covering the Instagrammable spot -Tebing Langit. The 5km trail is not easy as it sounds. The trail involving Tebing Langit includes natural rocky paths, slippery 45-degree slopes and uphill climbs which tests the stamina of each participant. The registration fee for adult was RP100k while RP60k for the kid between 10 years old to 16 years old. T-shirt, snack and mineral water were provided for free. The kids run was 2.5km only without passing through much the forest. Snack offered for participants were packed in boxes.